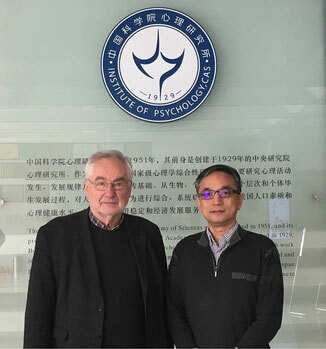 Prof. ZHANG Jianxin from the Institute of Psychology, Chinese Academy of Sciences (IPCAS), in Beijing, and Prof. Ernst PÖPPEL from the Institute of Medical Psychology and the Human Science Center, Ludwig Maximilian University in Munich, are both Editors-in-Chief of the „PsyCh Journal“, China’s premier international psychology journal. 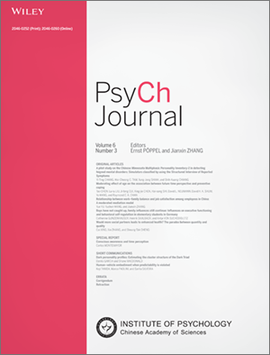 The journal is published by WILEY and the IPCAS. 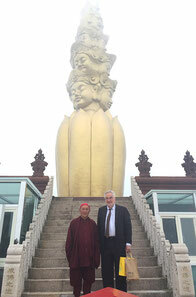 On the occasion of a „Think Tank“ in Yangon (Myanmar) to discuss the foundation of a „University of Life and Peace“. 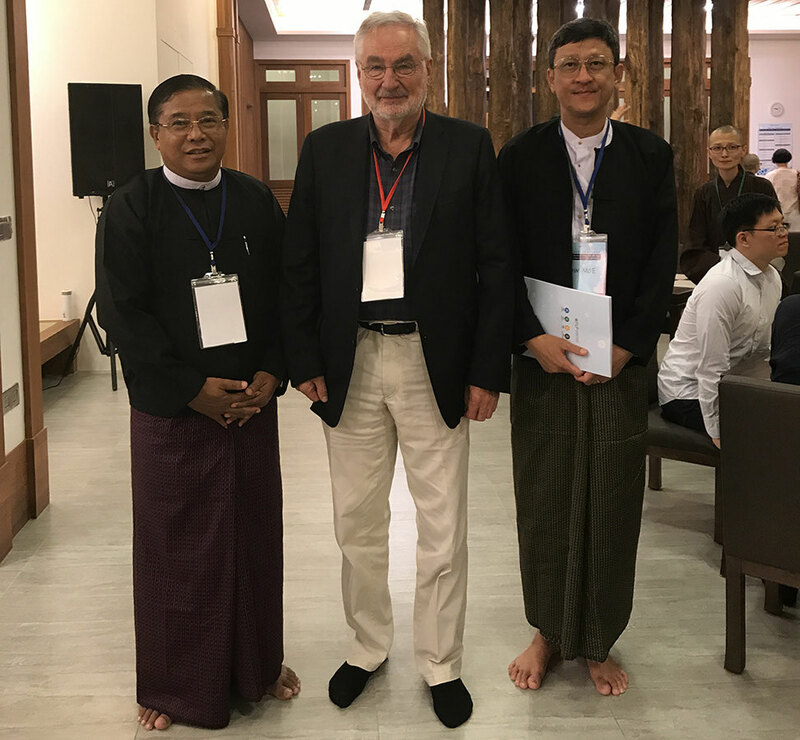 The picture shows Ernst Pöppel with Aung Than Htut, Lt. Gen. (Ret), Parliament Member, who supports this initiative (on the left), and Director Win Moe from the Tun Htaik Tin Company. On the right side of Ernst Pöppel his Excellency Prof. Ovid Tzeng, Honorary President of the ICCS and former Minister in Taiwan, leading cognitive scientist, and a good friend. 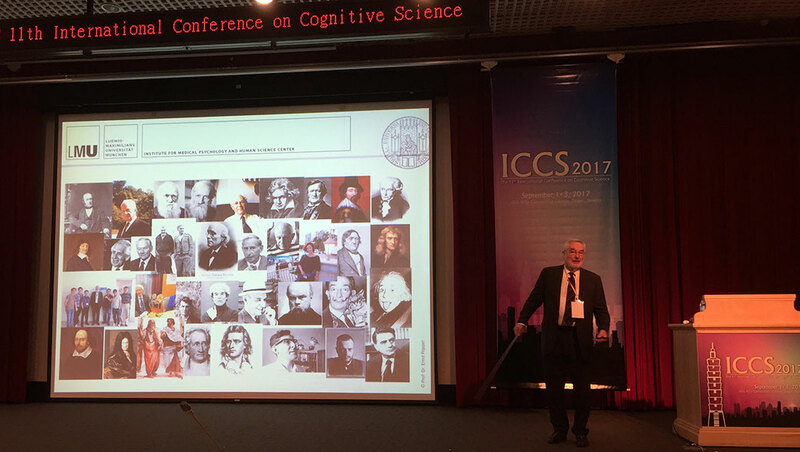 Keynote lecture at the 11th International Conference on Cognitive Science (ICCS) September 2017 at the National Taiwanese University (NTU) in Taipei. Title of the lecture: „Distinction between cognitive content and operative logistics in a taxonomy of functions“. The last picture shown at the lecture expresses the gratitude we all owe to teachers, colleagues, students, as well as scientists, philosophers and artists from the past. During the visit to the Lomonosov University Dr. Evgeny Gutyrchik, a co-worker of Ernst Pöppel, explains something with one of his typical gestures. 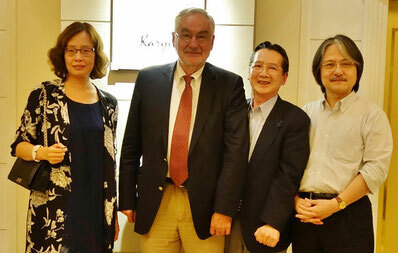 On the right side Dr. Jan Vasbinder, director of „Para Limes“ from Nanyang Technological University (NTU) in Singapore who is supported by Ernst Pöppel in the foundation of the „Para Limes Club of Explorations“, a new initiative to develop activities beyond mainstream in art and science. 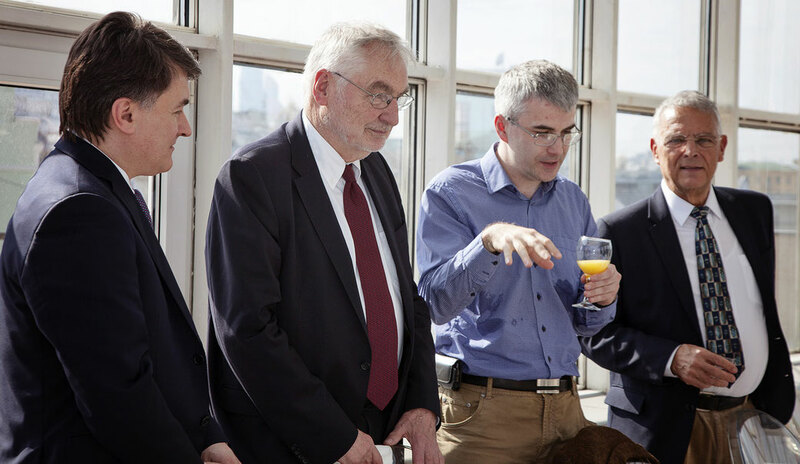 To the left of Ernst Pöppel Prof. Yuri Petrovich Zinchenko, Dean of the Psychological Faculty, President of the Russian Psychological Society, Vice President of the Russian Academy of Education, and a good friend. On top of the building of the Faculty of Psychology, Lomonosov Moscow State University at a visit in April 2017 to discuss common projects. One the right side one has a look towards the Kremlin. Together with Prof. Ludmilla Verbitskaya on the occasion of being elected to the „Russian Academy of Education“. 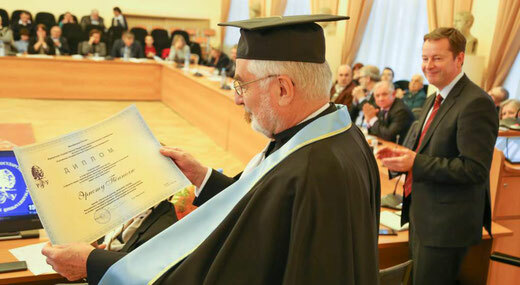 Prof. Verbitskaya is both president of the academy and president of „St. Petersburg State University“. On the occasion of receiving on honorary doctoral degree at the Russian State University of the Humanities (RGGU) in Moscow. To the right: The representative of the German Embassy Botschaftsrat Jan Kantorczyk. Vice Rector of RGGU Prof. Vera Zabotkina is the representative of „Cognitive Science“ as a research area in the sciences and humanities. 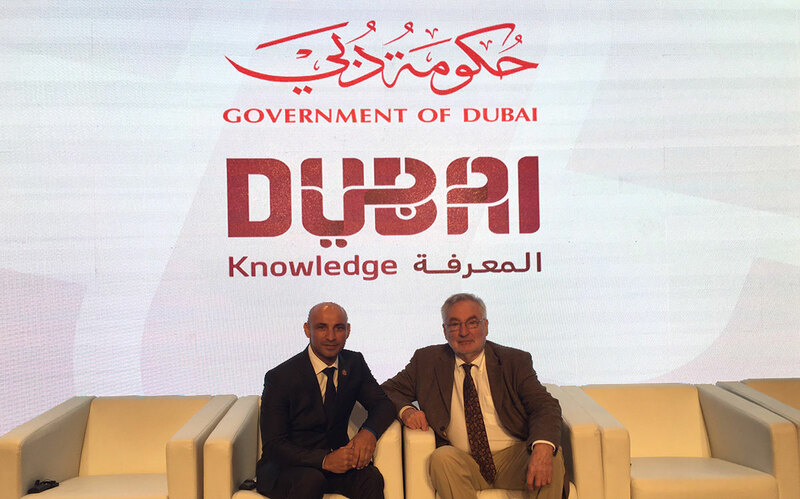 Since 2007 Ernst Pöppel is member of the International Sounding Board (ISB) of the Knowledge and Human Development Authority (KHDA) of Dubai. Recently, KHDA is trying to strengthen the academic contacts to China. 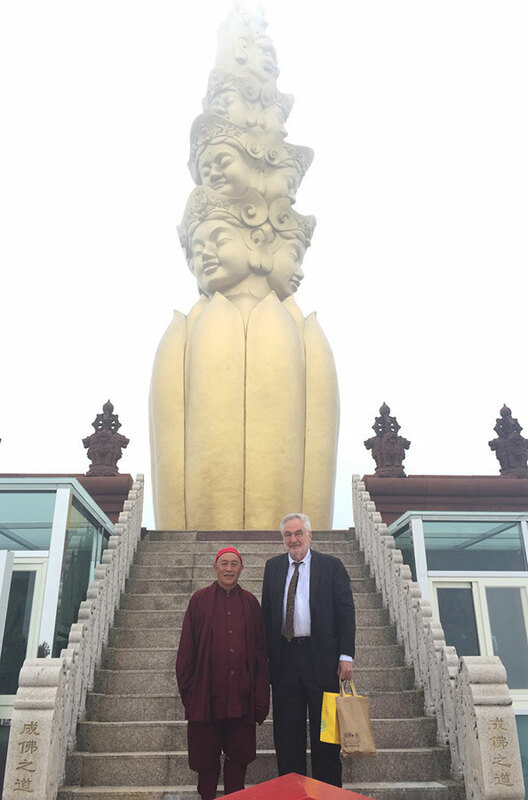 At a meeting in Shanghai in Octobre 2016 Ernst Pöppel and Dr. Abdulla AlKaram, Director General of KHDA, discussed challenges of this project. The government of Dubai provides many scholarships for Chinese students to continue their academic education in one of the branch universities in Dubai. Since years a small group regularly comes together to study the relationship between music and science, in particuar with reference to temporal aspects in music. Several members of the group were previously associated with Sergiu Celibidache. The picture shows participants of a symposium held in “Freies Musikzentrum” Munich in Octobre 2016 on the topic “Vergleichzeitigung. Resonanzen durch Musik”. 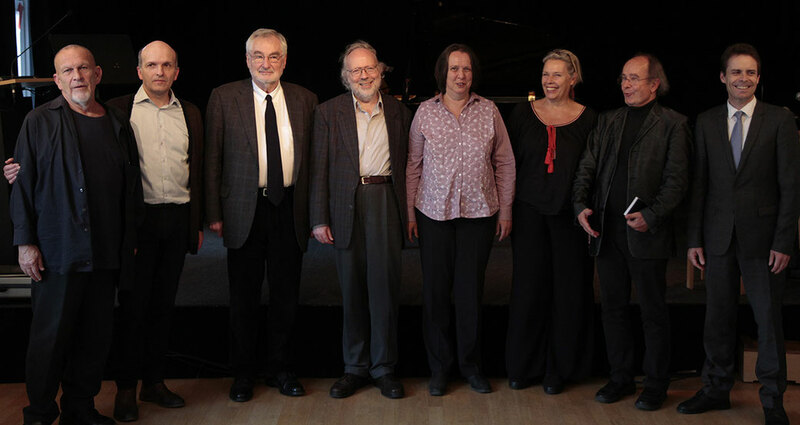 From the left: Peter Michael Hamel, Christoph Schlüren, Ernst Pöppel, Wolfgang Andreas Schulz, Christa Bützberger, Mareile Vaupel, Michael von Brück, Patrick Lang. 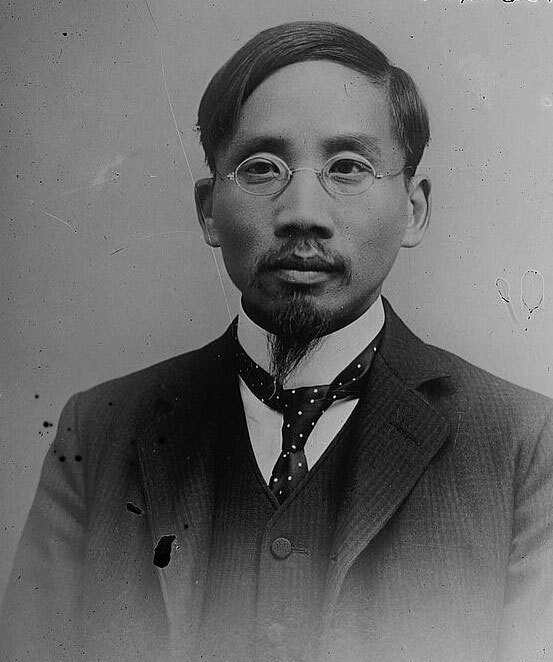 One of the most important presidents of Peking University was Prof. Yuanpei CAI (1863-1940), who had studied in Leipzig with Wilhelm Wundt in 1907. 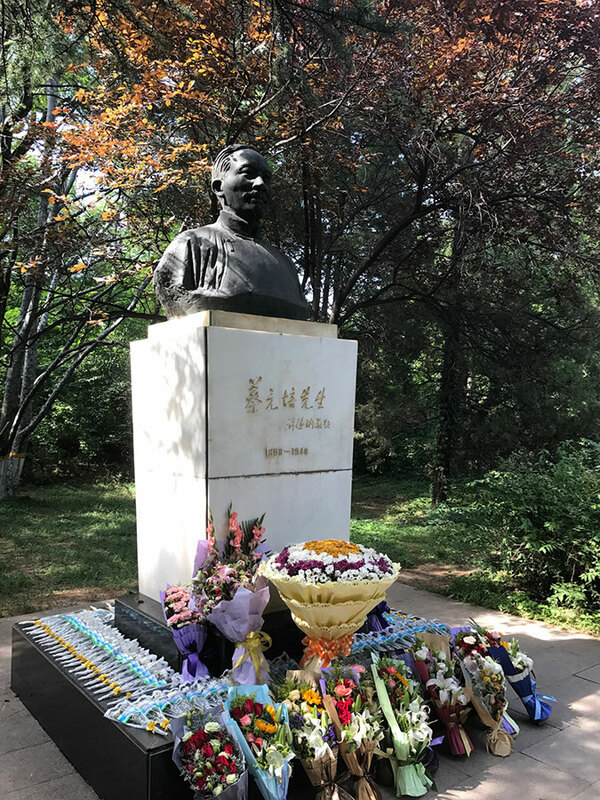 His statue on the campus of Peking University is always decorated with flowers. On the basis of his German experiences he introduced psychology as a new field at Peking University, where he was president from 1916 until 1927. The 50th conference of the German Psychological Society was held in Leipzig to commemorate the foundation of the first laboratory of Experimental Psychology by Wilhelm Wundt in 1876; his portrait in the back. The picture shows the members of a Chinese delegation under the leadership of Prof. Shihui HAN (to my right) from Peking University. 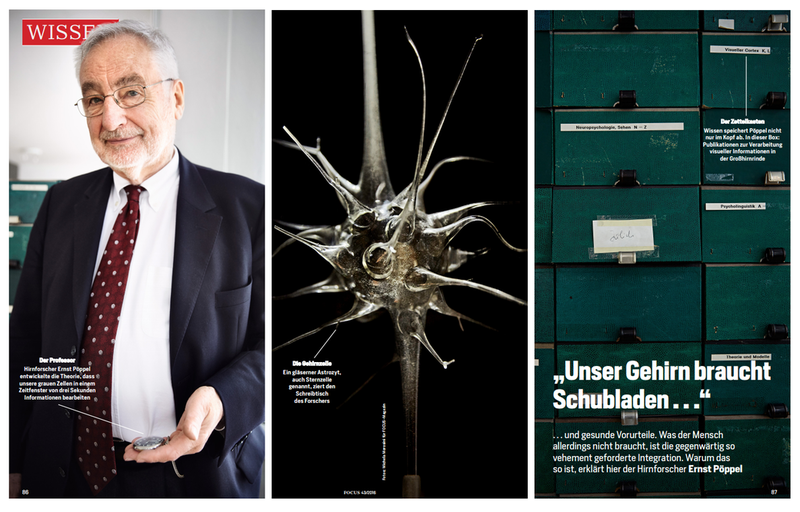 Interview im Magazin FOCUS, Ausgabe 43, vom 22. Oktober 2016. Sie können das vollständige Interview über den nebenstehenden Download-Button herunterladen. 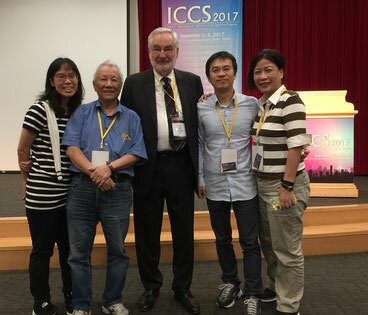 György Buzsaki from New York University, Guy Orban from Parma (Italy), Giacomo Rizzolatti also from Parma, Atsushi Iriki from the Riken Institute in Tokyo, and me. 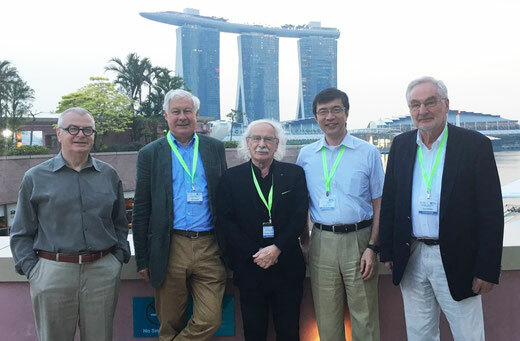 The conference "East-West Connections: Grand Challenges in Brain, Cognition and Good Life Research" was held at NTU (Nanyang Technological University) and organized by Jan Vasbinder (Director of Para Limes), and Balázs Gulyás, Professor of Translational Neuroscience, LKCMedicine. 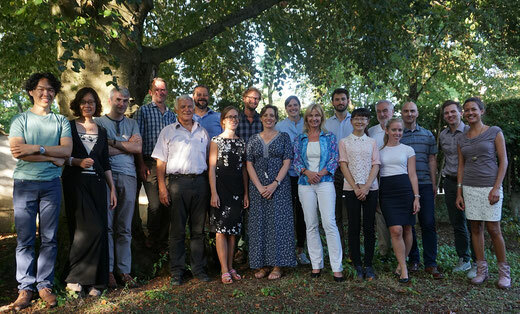 Other participants were Peter Somogyi from Oxford, Tamás Freund from Budapest, Paul Matthews from London, Wolf Singer from Frankfurt, Mara Dierssen from Madrid, Fredrik Ullén from Stockholm, Jean Decety from Chicago, Torkel Klingberg from Stockholm, Stanislas Dehaene from Paris, and Henrik Ehrsson from Stockholm. More than 200 people from science, economics, politics, media, the arts in Singapore registered for the conference. The topic of my talk was: "The power of single case studies: Examples from the early visual pathway." 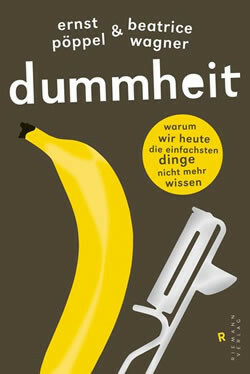 NEW BOOK OUT OCTober 17: "TRAUT EUCH ZU DENKEN!" 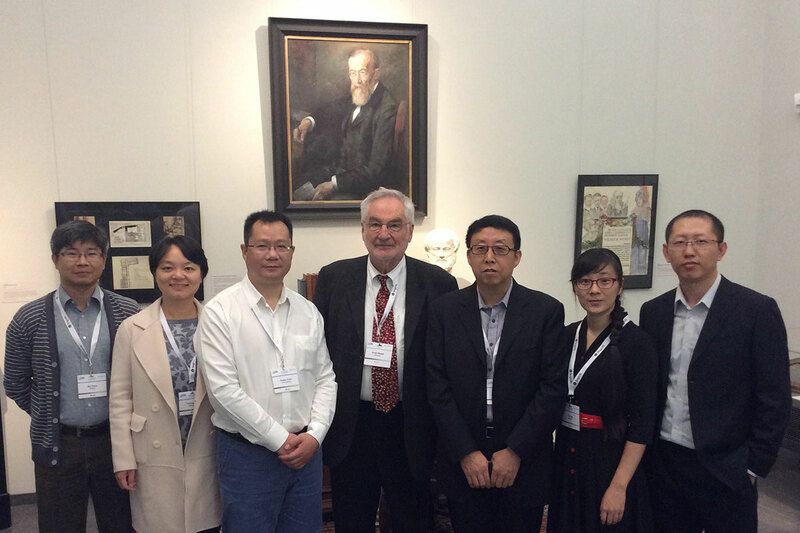 "University of Life and Peace"
Xiaoxiong Lin; Prof. Yan Bao; PD Dr. Evgeny Gutyrchik; Hans Peter Michel; Tabea Matt; Susana Lara Maier; Maria Reinisch; Nan Mu; Dr. Aline Vedder. Manfred Gödel; Alexander Benz; Josef Bäuml; Jana von Trott zu Solz; Tobias Batram; Prof. Ernst Pöppel; Wolfgang Grundler; Fabian Simmank; Dr. Sarita Silveira. The ICP2016 World Conference of Psychology on July 24-29, 2016 in Yokohama. 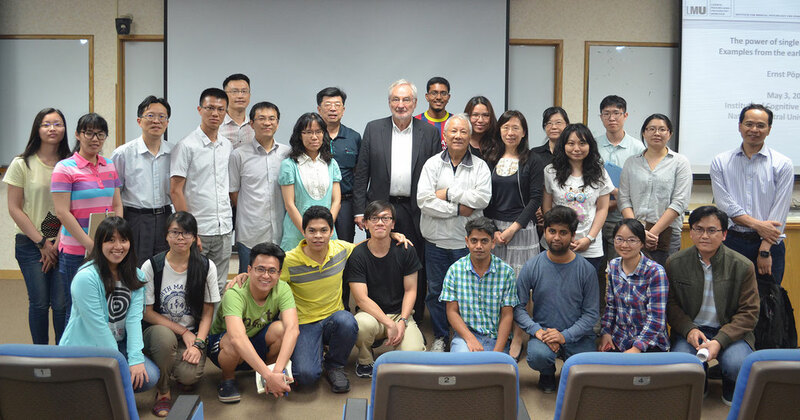 Lecture on "Single Case Studies" in Taiwan. Brain scientists and psychologists are often victims of theories coming from other scientific areas. 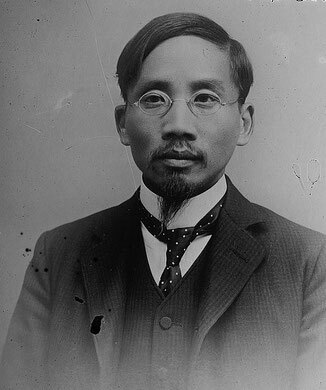 One example is the "treatment of time" in philosophy or physics. In our article we try to escape from these concepts in these disciplines. We use as a unifying concept of "temporal experiences" the psychobiological principle of homeostatic regulation which leads us to the idea of "identity" with its two meanings, i.e., identity of percepts or thoughts and self identity. Comments are welcome; the Frontiers journals provide the opportunity to comment either constructively or destructively. In Zeiten der rasanten Zunahme von Informationen gewinnt der einzelne Mensch nicht etwa an Wissen, sondern verliert es dramatisch. Intuitives Wissen, die Fähigkeit zur Selbstkontrolle, das Wissen um das menschliche Maß, Handlungswissen – was über Generationen überlebenswichtig war, werfen wir zugunsten von „immer mehr“ und „immer schneller“ über Bord. In sieben Exkursen veranschaulichen Ernst Pöppel und Beatrice Wagner, warum wir in so vielen Bereichen so wenig wissen und plädieren für die Intelligenz der Langsamkeit, der Pausen, des Unperfekten. Anhand von prägnanten Beispielen entlarven sie größenwahnsinnige Projekte, aber auch individuelle Dummheiten. Die Dummheit ist nicht zu vermeiden, sie gehört zu unserem biologischen Erbe, ihre Fallen zu kennen, kann aber helfen. Why TRIPLE-P, a personal publication platform? One of the best paper I ever published together with some colleagues had 11 reviews before it was accepted for publication. ((E. Pöppel, P. Stoerig, N. Logothetis, W. Fries, K.P. Boergen, W. Örtel, J. Zihl: Plasticity and rigidity in the representation of the human visual field. Experimental Brain Research 68 (1987) 445-448)). Just imagine how much time was invested: 11 reviews. ((Actually this paper never caught the attention of others.)) If I add it all up beginning with my first scientific publication in 1967 ((actually on some statistical problems in parapsychology)), reviewers invested hundreds of hours in my work – thank you (!) -, and often wasted their time – I am sorry(!). Being now retired, I decided no longer to ask for temporal investments of reviewers by submitting papers to scientific journals. ((This does not imply not to co-author papers of my younger colleagues, but certainly not in any prominent position of authorship.)) However, trying to be active also in the future and not falling into silence for the rest of my scientific life, I want to use this TRIPLE-P to communicate some results and ideas which never were seen by a reviewer. And TRIPLE-P serves another purpose: Some publications from the past are often hidden in books difficult to find; some of them are made accessible here, and quite a few are written in German. ((A warning: Some of the papers are written “tongue in cheek”. Who ever heard of “igniology”?)) For practical purposes, I include also my academic cv, and I thought it might be helpful to add a list of some earlier publications (most of them being reviewed) with short comments.